Text and Images: ABRD Architects National council of Science Museums (NCSM) an autonomous organization under the Ministry of Culture, Government of India is the apex body, responsible for setting up and running several Science Cities, Science Centres and Science Museums in India. It is primarily engaged in popularizing science and technology and creating scientific temper and attitude among the common public in general and young students in particular. The proposed Science City in Guwahati was envisaged as being conceptually similar to a modern Science centre but of a much larger dimension with focus on frontier areas of Science and technology & modern presentation techniques. It is conceptualized on the theme of EDUTAINMENT to provide enhanced holding time to its visitors and to make science learning effective, impressive, and enjoyable. Land area to the tune of 30 Acres had been committed and earmarked by the State Government of Assam for the proposed Science City project at Tepesia Village, Sonapur Circle, Guwahati, Assam. The site is at an approximate distance of 22km from the city Centre and 3km away from NH 37. The embarked site is a beautiful mixture of natural contours of hills, gorges and plain land. The area is well covered by trees, shrubs and similar vegetation. 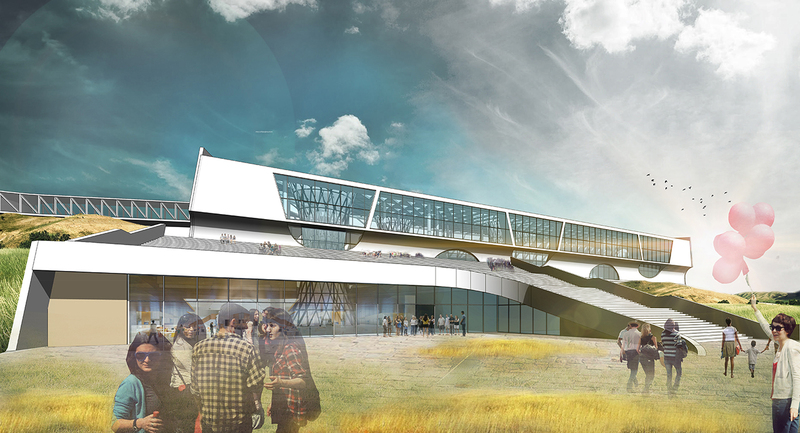 The project was imagined as an iconic Science centre not only for the region but for the entire country. 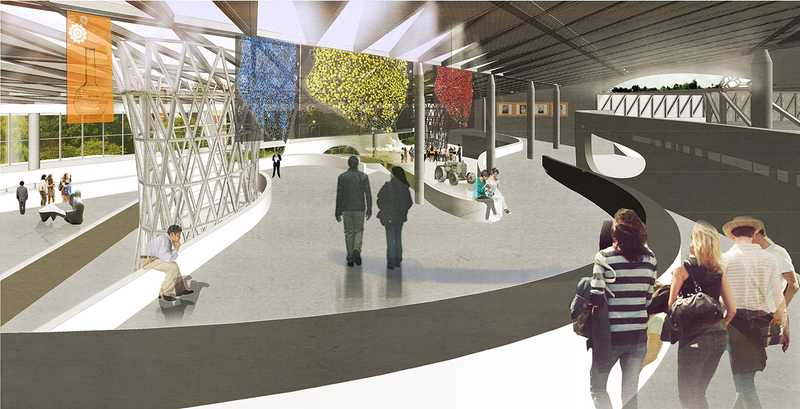 Imagery inspired from science fiction movies and natural curvilinear geometry formed the basis of the project. Site topography and drainage pattern was utilized to form natural rainwater retention ponds, which form the bio diversity zones like aviary and bio domes. The water retention ponds become the structuring element of the site. Based on the contours and vegetation of the site, different zones for different activities are established around the site. The main curvilinear pedestrian spine connects the different components distributed on the site. 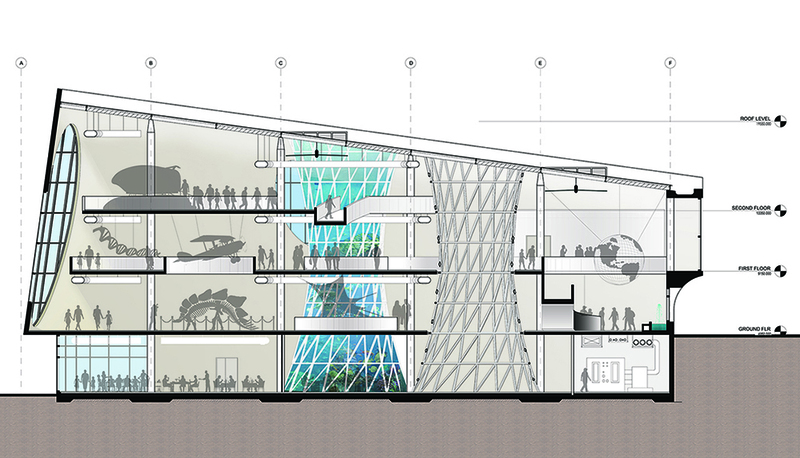 The main museum building was conceived as a continuous and fluid space particularly by its innovative structural system. The main structural element supporting the floor plates were steel tree like lattice structures that penetrate the floor plates internally. These vertical flexible structural members serve as means of vertical movement; light, air and water flow through these. The structural system enables large spans, open and flexible floor plates ideal for exhibits. 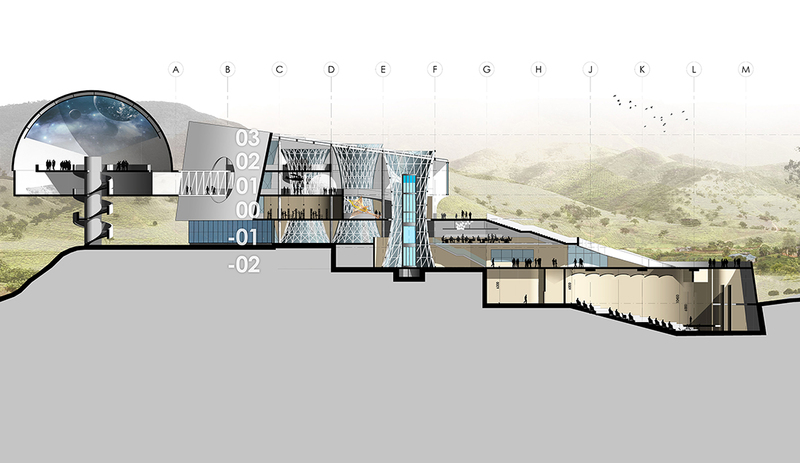 The open floor plates are connected through gently sloping and curved ramps, which form a movement loop within the museum building. 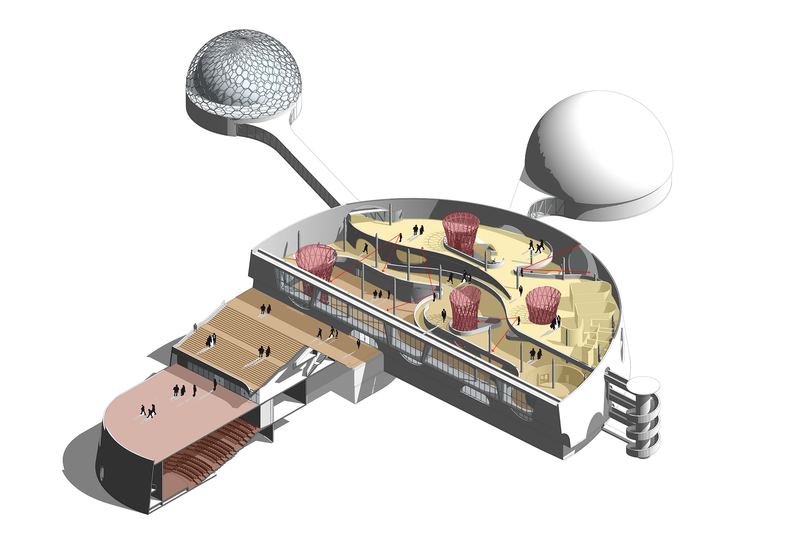 The Space odyssey Planetarium and Panorama Theatre are attached to the main building through bridges and catwalks. The entire museum building is covered with a Building Integrated Photovoltaic Panel roof, which also fulfill more than 25% of the annual energy demand. Principle of sustainability are embedded in the various aspects of design. Apart from respecting and enhancing the natural characteristics of the site in terms of topography, sustainable geology, surface drainage, the abundant water available on site is used as a source of water, heat rejection of AC system, Cooling and Ventilation.